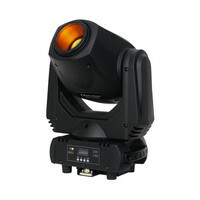 The iSolution iMove 350S will fill your venue with stunning light shows. 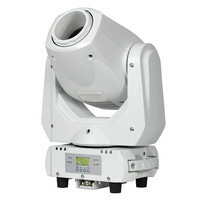 It is a high quality optical system with smooth stepper motors and separate colour and gobo wheels. The rich vibrant colours result in stunning lighting effects produced with a 60w LED source. The light output is similar to that of a 250w discharge lamp but with energy saving benefits longer life and a lighter weight. Operate in sound active master/slave or DMX mode. The Fluid 1LT Smoke Stream is a specially formulated mix designed to provide low density air-born fog effects. Specifically designed to work in conjunction with Atmotech range foggers this fluid can also be used in most other fog machines. The water-based composition leaves no oily residue making this ideal for live performances and parties alike. This powerful iBeat strobe is part of the iSolution series and can work in stand alone mode via internal programmes triggered by the external speed control or music. Please note: this item was returned unwanted from a customer. The original boxing is scuffed and all the seals are broken. Otherwise the unit itself looks and operates as new and has only been used a couple of times. 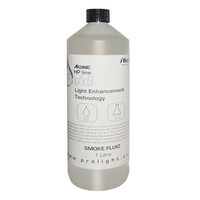 The Fluid 5LT Aquahaze Light is a aquahaze light fluid solution specially formulated for the Atmotech range of hazers. Manufactuared in the UK the water-based composition leaves no oily residue and is ideal for use with most haze machines. A high quality optically transparent air-born medium haze is produced with a light index of refraction making this ideal for beam projection. The Fluid 5LT Low Fog is a specially formulated fog fluid designed to produce a dense ground-hugging effect which disperses and evaporates before any visible rising. Manufactured in the UK the water-based composition leaves no oily residue and its dense fog qualities make this fluid ideal for dramatic stage scenes and Halloween parties. 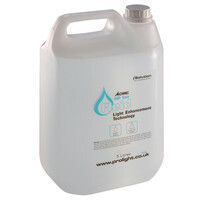 The Fluid 5LT Snow/Foam is a water based liquid specially formulated for use in all snow machines. The specially formulated solution lasts up to 30 longer than standard snow fluids and produces high quality snow flakes. The water-based composition leaves no oily residue plus its completely odourless and non-toxic. 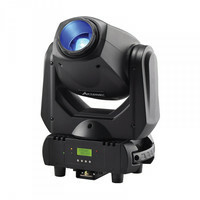 The iSolution iMove 350SR will fill your venue with stunning light shows. It features a 3 way indexable rotating prism remote focus and a manual zoom. The rich vibrant colours result in stunning lighting effects produced with a 60w LED source. The light output is similar to that of a 250w discharge lamp but with energy saving benefits longer life and a lighter weight.Operate in sound active master/slave or DMX mode. The Fluid 5LT Aquahaze Dense is a specially formulated fluid designed for the Atmotech range of hazer although the fluid can be used with most other haze machines. 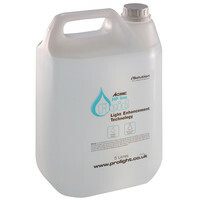 The water-based composition is manufactured in the UK and leaves no oily residue behind. The fine optically-transparent air-born medium haze is produced with a medium index of refraction making this fluid ideal for beam projection. 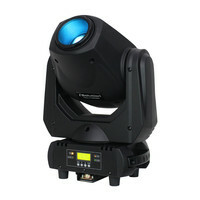 The iSolution iMove 150 is an impressive light show ideal for multiple applications. It houses a high-output 32w LumiEngin LED light which will easily outshine a traditional 150w HID lamp. It features 7 rotating gobos plus open and an independent colour wheel with 7 colours. 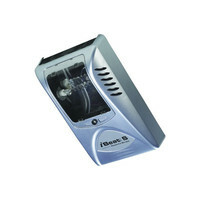 It can be operated in sound active master/slave or DMX modes. Simple control solutions are available when using the optional CA 8 controller which offers blackout strobe and programme access functions.